Hodgeman County coach Matt Housman doesn’t know if the polls motivate his Longhorn squad or not. However, Housman said Hodgeman County is “kind of used to” lower rankings and being underrated the last couple of years. Hodgeman County, the defending Eight-Man, Division I state runner-up, is 7-0 but ranked No. 5 in the classification. The Longhorns have only been ranked for the last couple of weeks. Hodgeman County has won every game by the 45-point margin against the second-weakest strength of schedule in Eight-Man, Division I, according to preppowerindex.com. The Longhorns are 19-1 in the last 20 games and have won 21 straight regular season contests. Spearville coach Matt Fowler has repeatedly called Hodgeman County the “measuring stick” in the west until someone proves otherwise. However, in the polls, the Longhorns rank as the third team in the west behind No. 3 Central Plains and fourth-ranked Spearville, both also 7-0. 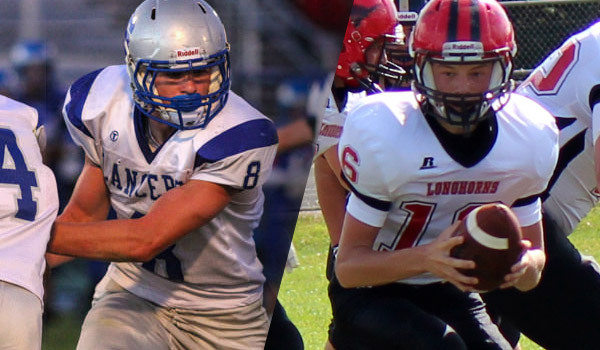 This Friday, Spearville plays host to Hodgeman County in a huge District 7 contest. Both teams are 3-0 in district; Ness City is 5-2, 2-1. Ness City hosts Hodgeman County in Week 9. Spearville has played the No. 22 SOS and has a Week 1 victory against Madison (32-28) and a Week 5 win versus Ness City (50-38), teams that are a combined 10-4. The Lancers have outscored teams 380-110. Spearville has lost five in a row to Jetmore/Hodgeman County, the closest a 38-14 defeat in 2013. Hodgeman County ranks No. 1 in offense and No. 2 in defense in the classification, outscoring teams 410-50. The Longhorns have averaged 393 yards of total offense per contest and are balanced with 178 passing yards a game and 215 yards rushing a contest. Senior Kolt Washburn has 60 carries for 818 yards and 14 scores, while senior Will Crabill has 71 carries for 386 yards and 18 touchdowns. Seniors Brennan Harms and David Nuss, both captains, start at guard, and junior Trevor Briggs is at center. Briggs is 6-foot-1, 275 pounds, Harms stands at 6-foot-1, 250 and Nuss is 5-foot-10, 168. Hodgeman County assistant coach Oliver Salmans was an assistant for legendary Hanston coach Jerry Slaton; Housman played for Salmans and Slaton. Salmans had a successful run as head coach at Pawnee Heights, too. Salmans has now served as assistant for Housman, and his son, freshman Jacob, has played great as the starting quarterback. Jacob Salmans has completed 62 of 92 passes for 1,243 yards with 17 scores against three interceptions. Fowler, with multiple skill players and a veteran offensive line, has been pleased with the Lancers’ offensive efficiency and special teams in recent games. The Lancers played very well on third down versus Ness City, and had a 65-yard kickoff return for a score against WaKeeney-Trego last week. Spearville scored every possession against Ness City, except just before half and a drive late in the game that stalled inside the Eagle red zone. Spearville has just two turnovers this season and six in the last two years. Hodgeman County has six this year, but is plus-8 in turnover margin. Seven players have tallied a rushing score, and sophomore Luke Heskamp as 66 carries for 638 yards for 12 scores, and junior Nathan Stein has accounted for 1,033 total yards and 16 offensive scores. Freshman Bailey Sites is the No. 3 rusher with 24 carries for 344 yards and six scores, but that’s virtually all come in mop-up duty. He never had a carry against Ness City because of Spearville’s talent.